Despite a flawed framing device, David Staller dusts off George Bernard Shaw’s play for a vigorous interpretation. Lane Williamson reviews. There’s a layer of dust settled on the works of George Bernard Shaw. His particular brand of verbal dexterity fell out of fashion long ago and it’s not likely he’d be named a lot of people’s favorite playwright. The challenge in presenting his plays now is to blow the sediment off of them, not with a light dusting, but with a gale force that power-washes them clean and reveals a fresh play. Such was the case with the recent Broadway revival of Saint Joan, in which Condola Rashad, Patrick Page, and company brought Shaw’s text to vibrant life. It is also true of Gingold Theatrical Group’s current revival of Heartbreak House at Theatre Row. Director David Staller achieves this not through an erroneous framing device he has placed around the play, but with casting that, for the most part, allows skilled actors to revel in Shaw’s wordplay. In particular, Karen Ziemba and Alison Fraser apply their skills honed in the musical theater to create a smooth linguistic flow and vivid characterizations. Ziemba has a warm, open presence, manifesting the heart of the play. She is comfortable with Shaw’s language and navigates the various plot devices with ease. Her Hersione Hushabye is confident and unfazed by her husband’s flagrant philandering; she does not value herself by her husband’s favor. Shaw does not have Hersione make excuses for her husband, nor does he have her accept his wandering eye. He allows her to show her disdain by attempting to pawn him off on the ingenue, Ellie Dunn (Kimberly Immanuel), a woman caught between two potential matches. Immanuel is not as successful at enlivening her character, but Shaw has also not drawn Ellie with as detailed strokes. Immanuel is adrift with the text, offering little specificity in differentiating Ellie’s mood and tonal shifts. While all the actors perform in the broader style of a British music hall, Immanuel does not find a negotiation between stylization and believability; the result is petulance without variation. This is also the case with Tom Hewitt as Hesione’s husband and Ellie’s crush, Hector. Hewitt is all bluster and exaggeration in his portrayal of an actor in love with the sound of his own voice. Is it possible to play someone so egocentric and removed from reality, but still keep the truth, the hurt, and the pain beneath it? I’d argue that it is, and this nuance is lacking from Hewitt’s portrayal. Alison Fraser as Hersione’s sister, Ariadne Utterword, is the play’s funniest character. Fraser wrings each word dry with her stretched, nose-in-the-air dialect and physicality. She is adept at bringing Ariadne’s feelings of displacement (her family pretends like they don’t recognize her) through her conceited façade. Fraser has a monologue near the beginning of the play in which she met every beat of the text with a sharp punch, but it did not get the reaction it deserved from the largely silent audience around me. It was clear that Fraser was playing the speech for all it’s worth, but there was a discernable disconnect between her performance and the audience reaction. Heartbreak House takes place in 1914, but Staller’s interpretation occurs in the basement of the Ambassador Theatre in London immediately following a World War II-era bombing. The conceit of his framing device is that the actors in a play upstairs have been driven into the basement to wait out the exploding arsenals. The audience has been sheltered underground with them, so, to pass the time, they decide to perform Shaw’s Heartbreak House, a different play than the one that was occurring at the time of the air raid. A director’s note from Staller attests that the framing device is closer to Shaw’s original intent: he wanted the play to be a piece of activism, warning the audience to pay attention to a world sliding towards war. Unfortunately, the restoration of this original approach does not add stakes or relevance to the events in Shaw’s play. The actors perform Heartbreak House as a distraction from the events upstairs. 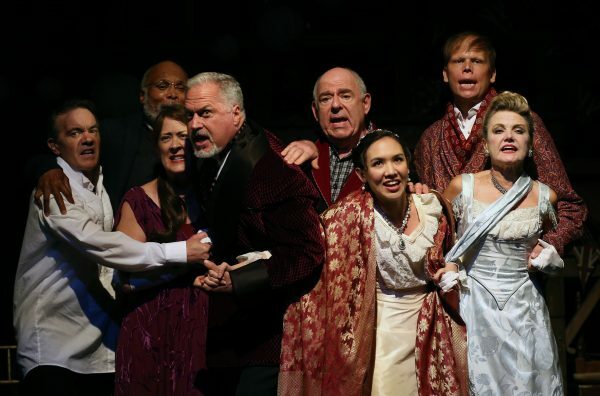 There are no cracks in the performances that indicate the actors are concerned for their lives and a couple earnest sing-a-long moments are merely confusing as many of my fellow theatregoers were unfamiliar with the period tunes we were asked to perform. The effect of the play-within-the-play could have been achieved through design and staging without fashioning a new scene to support it. Shaw modeled Heartbreak House on the Russian family dramas of Chekhov. At least in this production, it’s closer to Oscar Wilde, which makes the threat of a bombing seem kind of funny. In Shaw’s play, a bomb does finally descend on the house and two of the characters are killed. There is dialogue after the bomb is dropped, but Staller dispenses with that section, preferring to end the play with the sound of an explosion and a blackout. Does this mean Shaw’s bomb also eradicated the audience from the framing device? If so, it was nice knowing you. I wrote this review from the great beyond.